Of course, I was head over heels when I'd originally heard that Chvrches was returning to San Diego, but the excitement was bubbling over on Thursday, the day of show, when I found out that not only was my photo pass secured, but we'd also be able to attend the 91X X-Session at Phaser Control Studios. We felt that seeing an international artist in such an intimate setting warranted pulling Nova out of school in the afternoon and headed to the studio. I was specifically called out by name not to take photos, so I obeyed, but I'm kinda bummed after the fact because one, everyone else was doing it, and two, our picture with the band has the lighting of a 1970's shrink's office because there were these stage LED lights on in the background. Still, it was an amazing privilege, so thanks to 91X for letting us in on the fun. Afterward, we came home and got all of our work and homework done and then Nova and I went to the show at the OAT. Fortunately, another photog had an extra ticket, so after Darren's soccer game, he was able to join us and only missed the first couple Chvrches songs, though he did miss the moment a massive giant cockroach climbed up the seat next to mine and over the armrest to take a swim in my nacho cheese. The venue kindly replaced them for me, but there's nothing on this earth Nova hates more than roaches so we had quite the freakout. The show itself was amazing and we had amazing seats and it was nothing but joy. 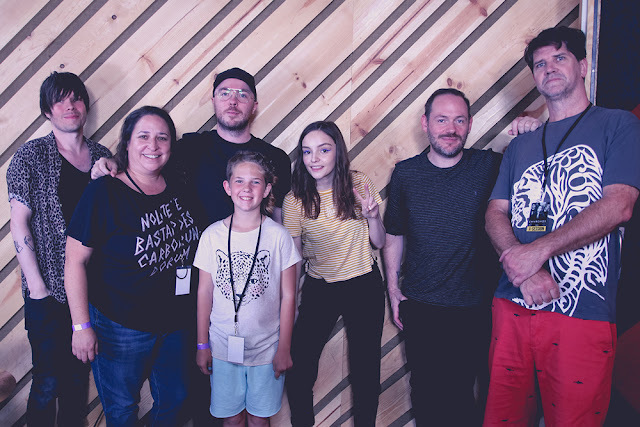 If you've seen Chvrches live, you know that they put on an incredible show, and if you haven't had the chance, don't miss them next time they come around. I tried to trim down the number of photos, but they're such a joy to shoot, I couldn't resist. Check them out after the jump. What a week! September is my favorite month of the year, and not just because it's my birthday on Friday. I share the birthday month with both my mom and dad, so we definitely get a lot of family time and lots of cheesecake, too, There are also typically a ton of great shows. I laid low and tried to catch up on work the early part of the week but on Thursday, we got a Chvrches double header with an afternoon X-Session and then caught them at the OAT that same night. On Friday, I worked at the Dodie show at the Irenic, then went to the SoundDiego party at Soda Bar. While Darren worked on Saturday, I took Nova to California Center for the Arts Escondido to see a film called Lost Rivers and do a creek stroll with the San Dieguito River Conservancy. I should also mention the Levitt Amp Series was going on with Euphoria Brass Band and it's a rad and FREE concert series every weekend with bands and food trucks and local artisans. I opted not to go out on Saturday, instead binging season 2 of American Vandal on Netflix. On Sunday, we celebrated my mom's birthday with a small gathering, then I worked at the Irenic for the Hannahlyze This podcast which was thoroughly entertaining. 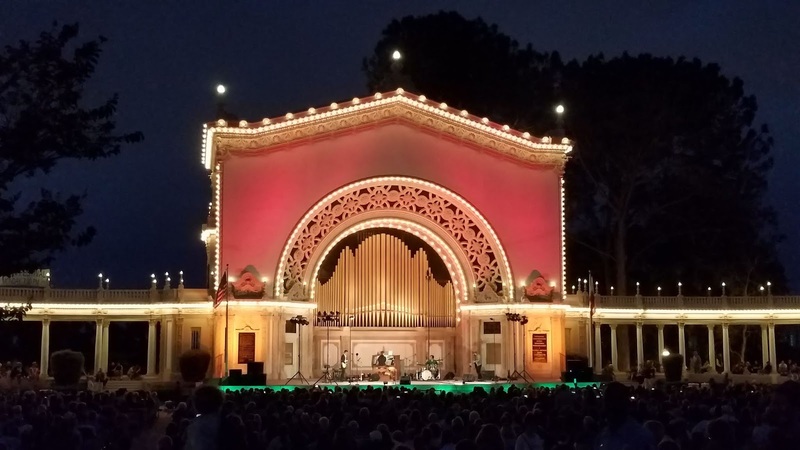 This week, I'm trying to catch Liz Phair and Speedy Ortiz tonight at the Belly Up and First Aid Kit and Julia Jacklin on Tuesday at the Observatory. My Wednesday just opened up, so hoping I can score a photo pass for Houndmouth at the Observatory with Family of the Year, and also catch The Boxer Rebellion at the Casbah the same night. I'm hoping Thursday we can do something fun like the Safari Park or the Zoo before going to the Casbah for Tim Fears' birthday celebration, and Friday, for my birthday, I'll be shooting Devotchka at the Observatory and then probably tying one on at the Ken after. I'm going to try to spend a lot of time at the Adams Avenue Street Fair, catch Lil Hurry Saturday night, and then wrap my weekend with Conor Oberst on Monday if I can track a photo pass for that one. It's a lot but my love for this time of year will hopefully power me through. Full listings through Monday are after the jump. It was a good and short week. I worked at the Samantha Fish show on Wednesday, on THursday, Darren and I got to go to opening night of The Heart of Rock n Roll at The Old Globe, and Friday we spent the night celebrating my dad's 70th birthday. On Saturday, Nova played her first game of the soccer season, and Saturday evening I got to interview Jade Bird at the Casbah. She was lovely to chat with and her show was exceptional, with Field Report's Chris Porterfield opening, who was also very nice to chat with. On Sunday we just had a low key day, walking to NOrth Parkk for dinner and enjoying the finally-bearable weather. I'm looking forward to the Belly Up tonight with Murder By Death and WIlliam Elliott Whitmore. I'll be working at the Irenic for Dreamers on Thursday, and I'll play it by ear the rest of the weekend. I am selling a Saturday KAABOO ticket for face value if anyone is looking. Full listings through Monday are after the jump. I was trying to figure out why I didn't have much in the way of new photos this week. I only went to a couple shows...on Thursday I went to Blonde for Wyatt Blair, The Slashes, and Ariel Levine and on Saturday I caught Slothrust. But I finally filed a claim for my cracked screen and spent most of the weekend transferring and updating to a new phone. There was also a lot of soccer, Back To School night at Nova's new school, and we had a super awesome time spending Friday evening at the Zoo, Sunday in Balboa Park for our little Jonze's birthday and then again on Monday evening for the Zeppelin and Pink Floyd Tribute at the Organ Pavilion. Ariel, Daniel, T-Bone, and Shelbi all did a great job accompanying the new Civic Organist, Raúl Prieto Ramírez. This week should be pretty chill, too. I'll be working at the Samantha Fish show on Wednesday. On Thursday, a dear friend hooked up tickets to opening night of The Heart of Rock n Roll at the Old Globe followed by Pinback at the Casbah, and I'm interviewing Jade Bird on Saturday for NBC. I'll probably mix in a couple extra shows if I can, though I'm super sad to be missing Indie Jam again this year. Full listings through Monday are after the jump.